Sooner or later, everyone will grieve the loss of a close relative or friend, whether the cause is a sudden heart attack, a car accident, a lengthy illness, or old age. This Special Health Report gives you resources and practices to guide you through the grieving process. You’ll find tips to help ease your pain and sadness, comfort yourself, and commemorate your loved one. The report also offers advice on ways to ease the burden when dealing with end-of-life decisions. The loss of a loved one can be a profoundly painful experience. The grief that follows may permeate everything, making it hard to eat, sleep, or muster much interest in the life going on around you. This emotional maelstrom can affect behavior and judgment. It's common, for example, to feel agitated or exhausted, to sob unexpectedly, or to withdraw from the world. Some people find themselves struggling with feelings of sorrow, numbness, anger, guilt, despair, irritability, relief, or anxiety. While no words can erase grief, Grief and Loss: A guide to preparing for and mourning the death of a loved one can help you navigate this turbulent time. In its pages, you'll find advice on comforting yourself, commemorating your loved one, and understanding the difference between grief and depression. You'll also find special sections on coping with the loss of a child, parent, or spouse. 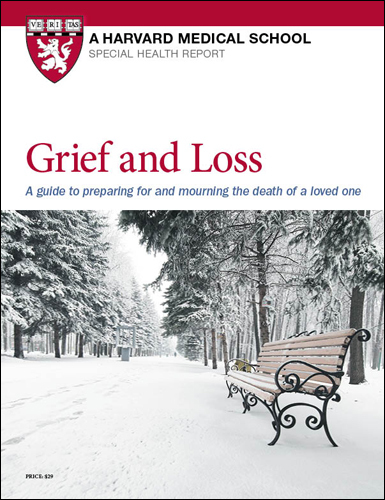 Grief and Loss also includes information on navigating life when a loved one is terminally ill, on end-of-life planning, and on ways to talk about death. Loss affects people in different ways. There is no "right" way to grieve, and no timetable or schedule for grieving. This Special Health Report aims to help you cope with the loss of a loved one at your own pace and in your own way. It offers numerous physical, emotional, and social strategies that help healing take place. At first, grief may permeate everything. You may find it hard to eat or sleep. It may be difficult to muster much interest in the life going on around you. You may experience restlessness, memory impairment, or difficulty concentrating. If you use alcohol, tobacco, or sedatives, you may find your consumption increasing. Symptoms similar to those the deceased had described may crop up in your own body—a frightening experience if he or she died from an illness. Some people, particularly children, may have other physical complaints, such as headaches, stomachaches, dizziness, or a racing heart. There had been occasions on which I was incapable of thinking rationally. I was thinking as small children think, as if my thoughts or wishes had the power to reverse the narrative, change the outcome. In my case this disordered thinking had been covert, noticed I think by no one else, hidden even from me, but it had also been, in retrospect, both urgent and constant. People who are grieving regularly have the experience of sensing the presence or hearing the voice of the deceased. These experiences are not pathological. Frequent thoughts of the person who died and feelings of self-reproach about aspects of the death are normal, too. The effects are not just emotional. You may also be more susceptible to physical illness. Among other things, studies have shown that immune cell function falls and inflammatory responses rise in people suffering bereavement. That may help explain why people often note a surge in ailments such as colds and why they tend to use more health care resources during this period. Following a loss, people are also at increased risk of hospitalization, high blood pressure (hypertension), and heart disease, and their existing medical conditions, such as heart failure, tend to worsen. Over all, they report reduced quality of life over the ensuing one to two years. 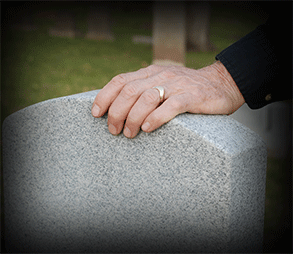 Indeed, bereavement increases the risk of death from a variety of causes, including suicide. There is even an increased risk of cancer for those who develop complicated grief (see “Depression and complicated grief.”). Expect that while you are grieving, you will not be yourself. But also know that the pain will not always be so intense. Self-care, which includes allowing yourself to be cared for, is important during these difficult times. This report offers many ideas for how to cope during this stressful time.